Russia’s two most visited cities are Moscow and St. Petersburg. These two capitals combine unique architectural styles, heritage and remarkably beautiful landscapes. However, it would be wrong to think that Russia has nothing more to offer. A vast land full of enigmas and unexpected revelations, Russia has many other sublime jewels in its rather impressive historical crown. 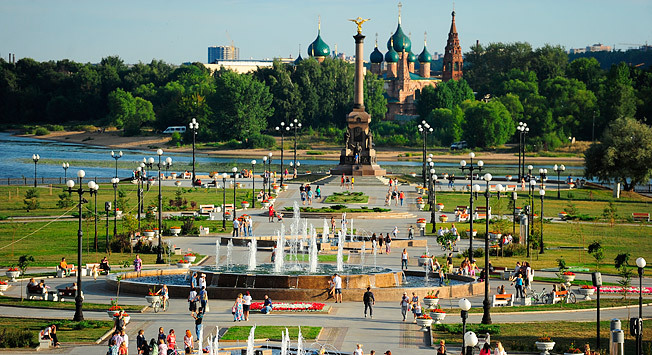 One such place is Yaroslavl, a city northwest of Moscow where two rivers – the Volga and the Kotorosl – meet in an eternal kiss. If you intend to delve into Russia’s history, there is no better place than Yaroslavl, which few visitors know was Russia’s capital for a short time. Today the city leads a tranquil and peaceful existence as one of the leading business centers in the European part of the country. It has a very modern air, but do not be deceived. Nothing hints at its history and former glory better than its remarkable architectural style and urban planning, which were led by Empress Catherine the Great herself. The streets are wide and peaceful, perfect for strolling and soaking up the air of what Russians call the “Time of Troubles,” a particularly challenging period in Russian history that lasted from 1598 to 1613. This period was marked by political turbulence, Polish intervention and eventually a full-scale war. Due to political circumstances, the choice for a new capital fell on the unlikely town of Yaroslavl. Yaroslavl had a favorable geographical position, but it was also considered a spiritual center for Russians, which is among the reasons why it was chosen. The temporary government under the leadership of Kuzma Minin and Prince Dmitry Pozharsky ruled from Yaroslavl, remaining there for four months. Minin and Pozharsky left Yaroslavl in November 1612 to retake Moscow. They entered Russia’s current capital protected by the Madonna of Kazan icon and ousted the Poles, liberating Russia. In Russia today November 4th is celebrated as National Unity Day in commemoration of these events. While the name of the first man in outer space, Yuri Gagarin, is known all over the world, few people know the name of the first woman to do so. This remarkable person is Valentina Tereshkova. In 1963 she brought glory to her hometown Yaroslavl by climbing aboard the Vostok 6 vessel, blasting off into space and orbiting around the Earth 48 times. Many places in the city, including a school, are named for her. She is 78 today. Culture runs in my blood, which explains my strong passion for theater. If you’re like me, the one thing you can’t miss when in Yaroslavl is the Volkov Theater, Russia’s first. Even if you don’t know Russian, you can still enjoy the atmosphere of the beautifully adorned theater. The actors here – upon perhaps Russia’s finest provincial stage – are masters at performing anything from Chekhov to Shakespeare. Is there a regional food specific to your city? Traditional rye bread, porridge, various types of "kissel" (a thick fruit dish often enjoyed as dessert) and fish have always been eaten by simple people and the aristocracy. To sample traditional foods try to coordinate your visit with a holiday such as Maslenitsa. Otherwise, head to one of the best restaurants for traditional Russian food anywhere, Sobranie. Located on the Volga embankment, the interiors here are traditional and charming in their simplicity and will help you get a better feel for Yaroslavl’s tranquil mood. Historically Yaroslavl has been a city of merchants, the kind of place where people were quietly determined to work, yet remained peaceful and calm; life here has never been as hectic as in Moscow. Today a typical person would be someone either involved in the oil industry or an ambitious entrepreneur, travelling back and forth to Moscow. The former phenomenon was partly influenced by the difficult economic situation in the 1990s when many young people struggled to restore the economy and earn money. I have always enjoyed long strolls along the broad Volga esplanade, especially during the "White Nights," when it never gets completely dark. Days are warm and nights are pleasantly mild and nothing can distract you from enjoying the sensual veil of dusk that covers the city and dances over the Volga. Start your stroll from Myod (Honey) nightclub, which is the most fashionable place in town, and walk in the direction of the Yaroslavl River Station. You’ll see the city’s glittering waterfront, old-fashioned Russian buildings and 19th century mansions, along with numerous churches, including the Assumption Cathedral, one of the great jewels of the city. I would highly recommend visiting the Mercure Koprino Bay Club on the Rybinsk Reservoir, outside Yaroslavl amid a beautiful virginal forest. It is absolutely perfect for spending a long weekend relaxing in nature, going fishing and hunting and enjoying modern accommodations and traditional Russian cuisine. For me it’s the ideal place to get away from the city and relax in beautiful surroundings.